There’s a multitude of companies out there offering citation services, including Synup, Yext, Whitespark, Moz Local, BrightLocal, and us of course – Advice Local. So which one is the best? One size does not fit all, so picking the local listing partner solution that works best for a particular business can be difficult. 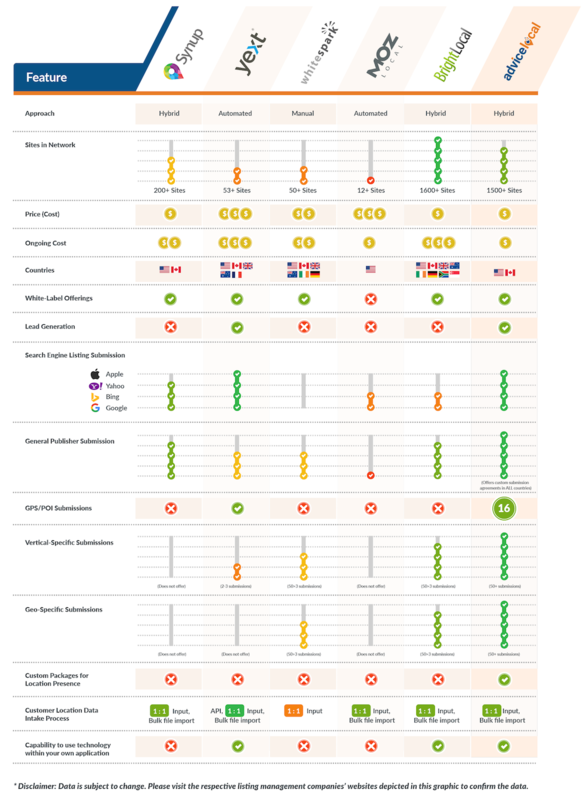 That’s why today, we’re going to let you look at the facts through our practical comparison chart, so you can easily decide for yourself. Was that chart techy enough for you? In case it was a bit too technical, let’s detail some of the meanings. As you can see, three of the citation companies mentioned above, including Advice Local, use a hybrid approach to local listing management – meaning we use APIs and manual submissions to create and claim local business listings. We are data partners with many of the data sources we submit to, which makes it real simple, real fast, and works in real-time to distribute data around the web. Yext and Moz are totally automated, and Whitespark does it old-school, meaning manual all the way. When it comes to pricing, just think of each dollar sign ($) as $100 or less. As you can see, Synup, BrightLocal and Advice Local come in at lowest price on average, with Whitespark and then the others following. When it comes to countries served, it’s United States all the way for everyone, with most others additionally serving Canada in their core offerings. So what’s the takeaway here? It’s that there are directories and data sources around the world to populate, and a good portion of the local listing management companies can submit to them. White-label offerings are one of the biggest needs agencies have, and 83 percent of the companies represented in this chart offer this feature. Most definitely, the agency partners are always looking for lead generation opportunities, and it seems Yext and Advice Local have this need met for them. I can’t speak for Yext, but Advice Local’s partners have access to integrate white-label local business data scanning widgets within their website, and with our technology, can have a white-label landing page up with just a few clicks. When it comes to Search Engine Listing Submissions, Yext and Advice Local hit all the big ones, while Synup, Moz Local and Bright Local support different variations. For General Publisher Submissions (think Judy’s Book and sites like those), Advice Local comes in on top for submitting to the largest quantity, with Synup and BrightLocal not too far behind. GPS and POI Submissions are a must for helping local businesses, franchises and brands get found within in-dash navigation and third-party solutions like Garmin. Partners that choose Yext or Advice Local are covered here. The others have not integrated this product into their local listing management solutions as of yet. Vertical and Geo-Specific Submissions, while important, don’t seem to be a priority for everyone right now. The order for this is Advice Local, BrightLocal, and then Whitespark. Yext also dabbles in this a bit. When it comes to custom local presence options, Advice Local is all about an agile solution that meets our partners’ needs. We take it well beyond local listing management to web development, on-page and off-page SEO, paid advertising solutions, and local-focused content ideation and creation. This is one area that sets us apart from the competition. We customize to meet our partners’ needs. Another area where all of the citation services companies represented in the chart seem to shine is bulk import. Partners with a big list of businesses they represent can get their data imported into the various citation companies’ technology fairly simply, it seems. And last, but certainly not least, is the ability to integrate listing management services and dashboards into third-party technologies– it seems Yext, BrightLocal and Advice Local take the wins here. Now that we’ve gleaned through some of the differentiators, let’s look a bit more in-depth at how each local listing management company builds citations. Synup listings seem to distribute out quickly, and when a business wants to scale up and submit more locations, it’s easy. Their pricing starts at $30 per location and will adjust downwards, as the number of locations a business has with them is increased. Yext’s automated solution means that business data submitted through them remains intact as long as the relationship with the partner or business stays in active status. Whitespark builds citations by hand starting at $4 each. According to their website, it costs more for local/niche citations, and they do submissions for every country in the world. BrightLocal’s citation services are manual, so the process to get a listing to live status will be longer. They charge per site, versus a package pricing (according to their website). They charge $3 per site retail. The Moz citation submission process is automated and it takes 4–5 days for new data to be published out. According to their website, their retail pricing starts at $99 per year per location. Wondering if I forgot about Advice Local? Oh, we definitely make the cut. We deliver real results in real-time. Partners describe our solution as real simple, real-time and real fast. These are words we live by! We have 50 data partners we distribute data to in real-time through our Data Amplifier Network. We have access to many more through manual options, but real-time is our first priority. The Real-Time Data Syndication Engine behind our technology is powerful indeed. There might be other companies that offer solutions similar to ours, but we also provide superior reporting and customer service – we are white-label all the way! Even though we will not turn away an SMB customer needing help taking control of their data, our priority is servicing our agency, franchise and brand partners. We are proud to shout from the rooftops that we have one of the two largest real-time networks available in the United States at this very moment. If that isn’t powerful, I don’t know what is. Unlike some of our competitors, we offer Google My Business and Bing Places claiming and optimization. We syndicate to the hard-to-reach Yahoo Local through our Data Amplifier Network. Not everyone can say this. Of course we have all the data aggregators covered – Localeze, Infogroup, Factual and Acxiom. Everyone who submits local business data with Advice Local gets a premium Judy’s Book Listing, a $250 value. If getting local businesses found on voice-enabled devices is a priority, we have that covered, too. Local business data is distributed to Google Voice, Siri, Alexa, Cortana, and even Samsung’s Bixby interface through our Data Amplifier Network. When selecting a local listing management partner, let the data do the talking. We have over 3.1 million businesses in our systems and on average, 1,000 reports generated each day. There is no better choice for local listing management and citation services than Advice Local, but hey, we’re just a bit partial. Request a demo for yourself and find out why today! * Please note: The data in the chart depicted above and within the blog post was compiled based on information on each listing management company’s website as of the date of publication. Solutions are updated regularly, so be sure to do your research as part of the decision-making process. 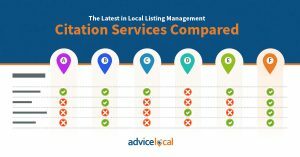 The post The Latest in Local Listing Management – Citation Services Compared appeared first on Advice Local.